I am so grateful for the opportunity to work with the Children’s Brain Tumor Project as the first Ty Louis Campbell Fellow. I thank Cindy and Lou Campbell and the TLC Foundation for funding this creative position. My passion is bioinformatics and computational biology, both of which play critical roles in decoding tumors such as DIPG, gliomatosis cerebri, and AT/RT—the cancer that claimed Ty’s life two years ago. After receiving a bachelor’s degree in biotechnology from Sun Yat-sen University in Guangzhou, China, I came to Weill Cornell in 2009. I’ve been here for the past five years as a Ph.D. candidate in computational biology, during which time I have published research articles on high-throughput sequencing data analysis for cancer biology in Nature Biotechnology, Nature Genetics, Journal of Clinical Investigation, and Genome Biology. I’ve also been a lecturer in cancer genome data analysis for courses at Weill Cornell Medical College and the Institute of Computational Biomedicine’s EpiWorkshop. I completed my doctoral dissertation on the topic of cancer epigenetic dysregulation, and I’ll be further pursuing that research in this fellowship. The science of epigenetics is relatively new, and it’s emerging rapidly. The term refers to changes in the ways genes are expressed that don’t change the DNA itself. Disruptions in the epigenome are thought to play a fundamental role in how cancer develops, but how those disruptions happen are only just now starting to be understood. Because they occur spontaneously, they cannot be predicted—which is why the rare and inoperable tumors that strike children seem to come from out of the blue. There are no known risk factors, no family history, no warning signs—just a child who is healthy one day and terminally ill the next. For answers, we must comb through a staggering amount of data that can now be produced through sequencing and other studies. 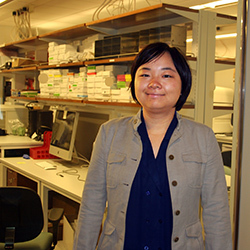 Today’s high-throughput sequencing methods are faster and more accurate than they were even just a few years ago, but each tumor sequenced produces an avalanche of data that must be pored over and analyzed by a bioinformatics specialist in order to find answers and draw conclusions—or at least identify new pathways for future studies. I am proud to be playing a role in the Children’s Brain Tumor Project’s multi-pronged research efforts—banking tissue for future study, sequencing tumors from a wide range of patients, interpreting the data produced from sequencing those samples, and then testing new drugs and new delivery methods selected specifically for that individual tumor. The Department of Neurological Surgery is working with the Department of Pathology, the Cancer Center, and the Center for Precision Medicine here at Weill Cornell as well as collaborating with other research institutes around the world. We are working hard, together, to accomplish the goal we all share: New hope for children and families facing a diagnosis of a rare and inoperable brain tumor.